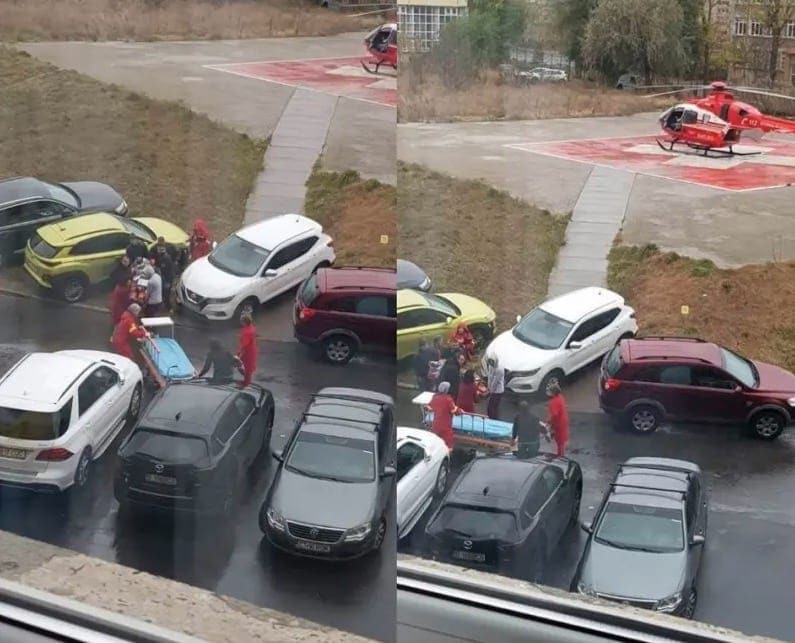 Motorcycles might be super cool, but they are also notoriously dangerous. It’s important to always make sure you are wearing adequate protection when you decide to go biking around town. It seems that this rule might apply to pets, too. 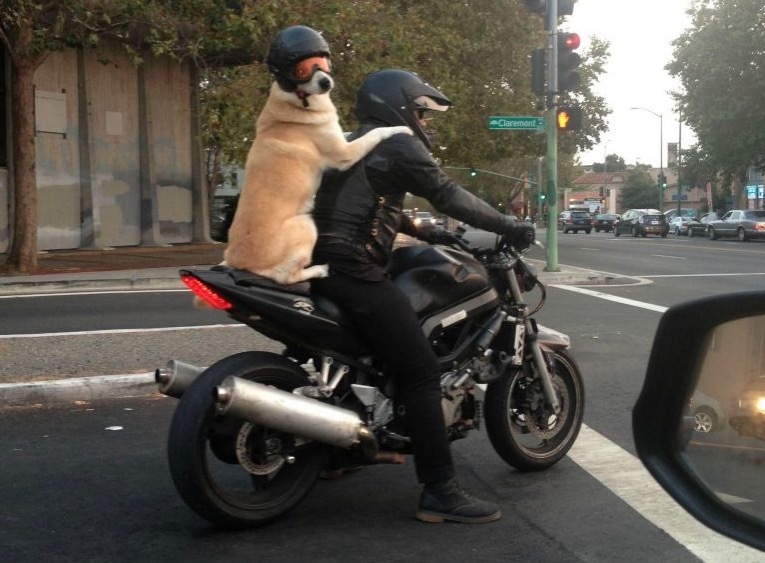 This biker wanted to bring his adorable dog along for a ride, and made sure to equip it with a helmet and goggles. That, combined with the way the dog is sitting makes it almost look like a person! At first glance, this looks like some kind of army vehicle carrying a lot of heavy equipment. 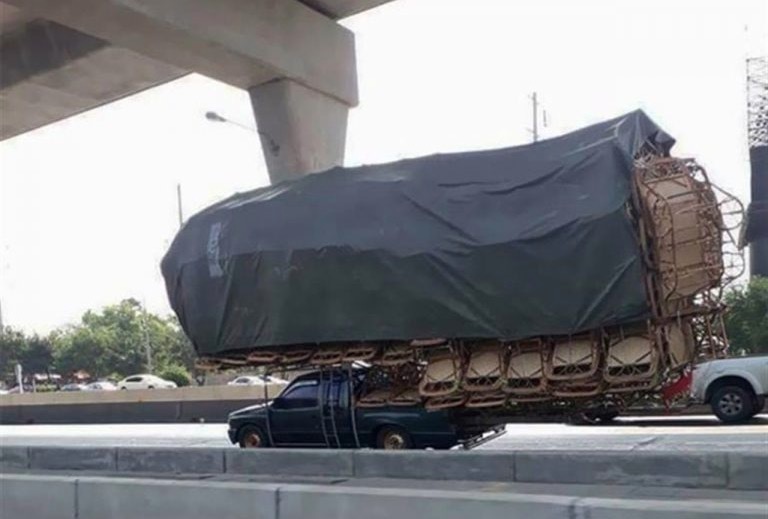 However, on closer inspection, it becomes apparent that it’s actually just a regular pickup truck carrying an astonishing number of chairs. Maybe they were left last minute with no way to transport the furniture or perhaps they were simply too thrifty to rent a larger truck. 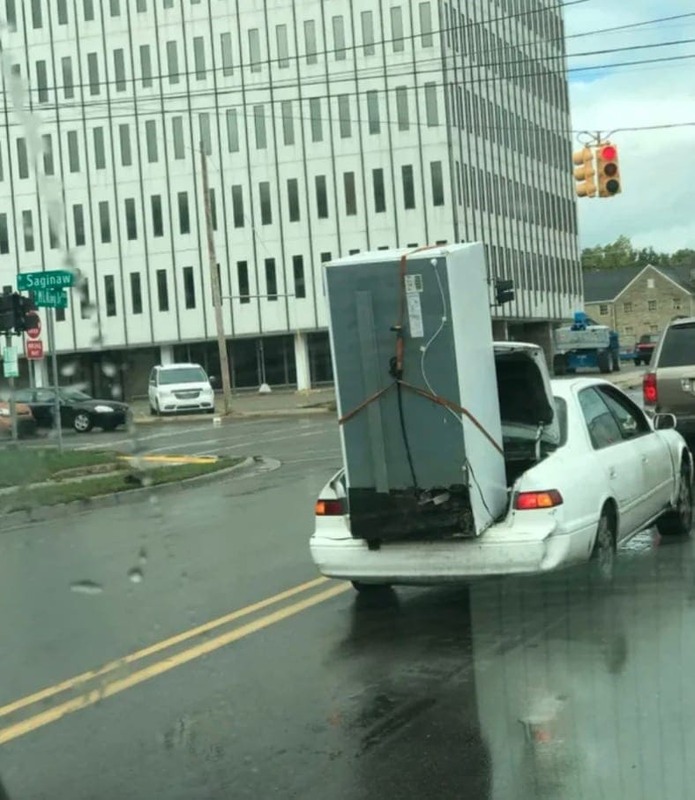 Either way, it doesn’t look too steady and we wouldn’t want to be anywhere near that load on the highway! We’ve heard the expression to put your foot in your mouth, which is used when someone says or does something that they regret afterwards. 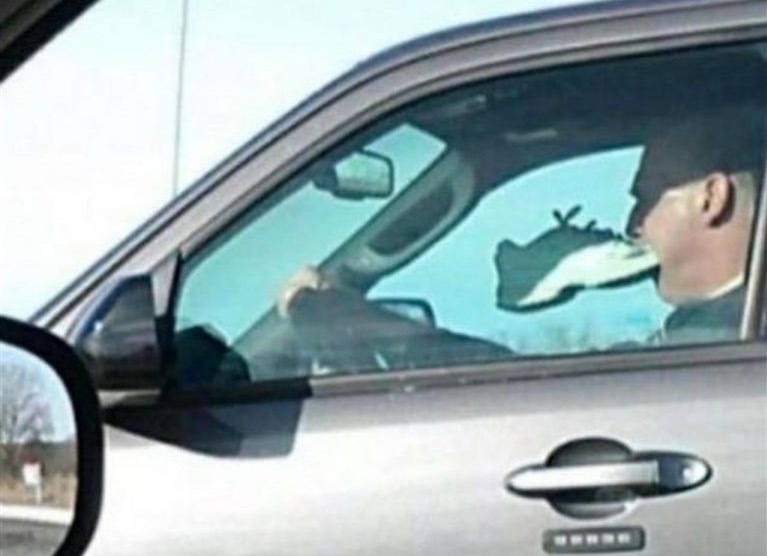 However, this is the first time we have seen someone with a shoe in their mouth. 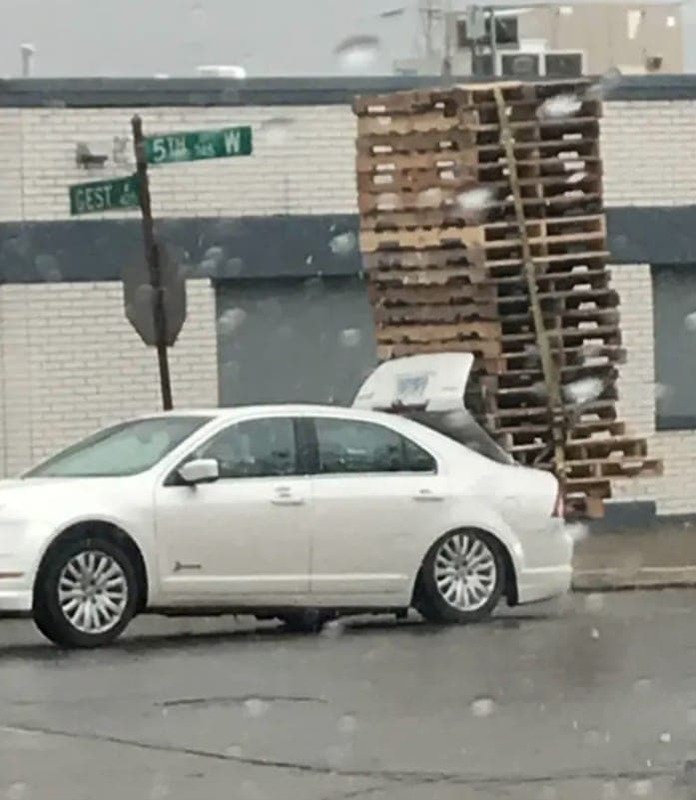 While there are tales about people getting so hungry that they eat their leather shoes, that does not seem to be the case here, and we don’t have any idea why this man is driving around town like this. 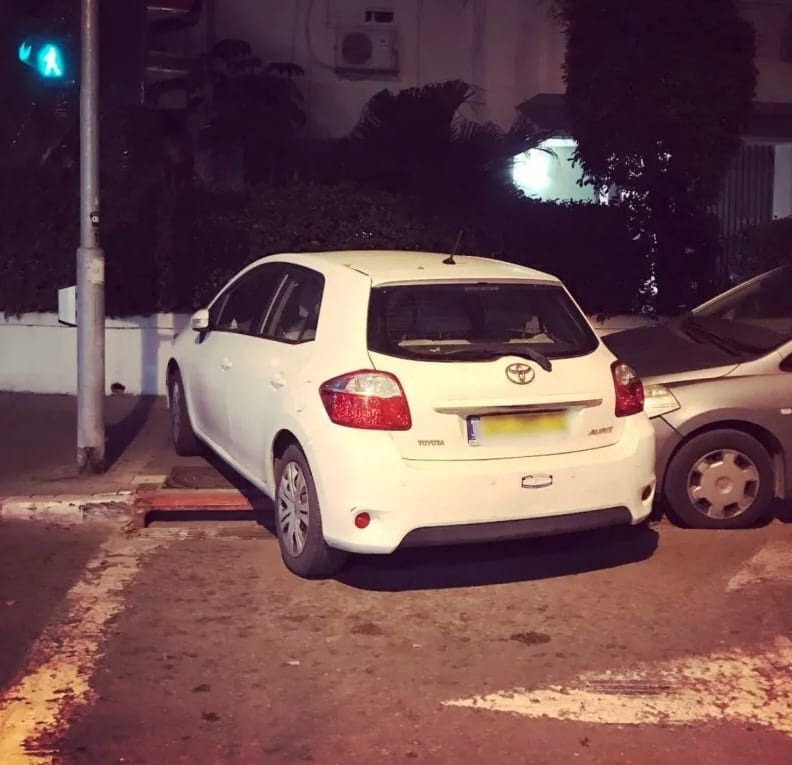 When someone parks badly, other drivers often want to teach them a lesson so they don’t do it again. Sometimes they do this by writing notes or drawing on the ground to make a point. 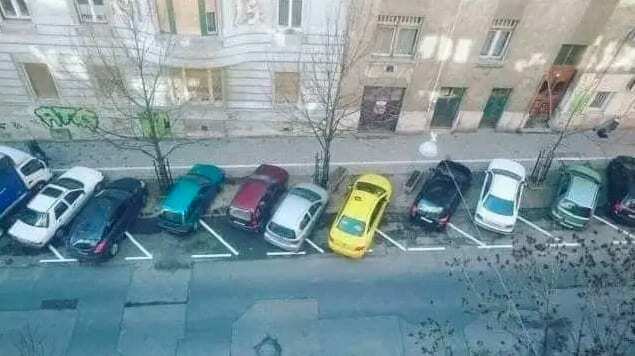 Other times, they show the terrible parker what’s what in the way that they park their own car nearby. 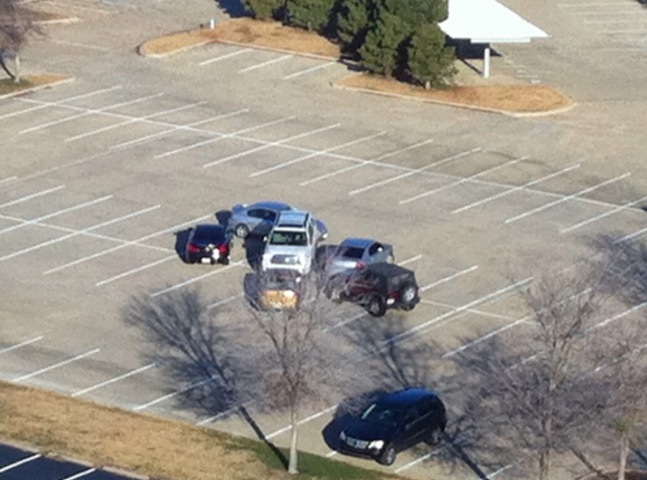 Here, several drivers surrounded someone who parked their car smack dab in the middle of an empty parking lot. 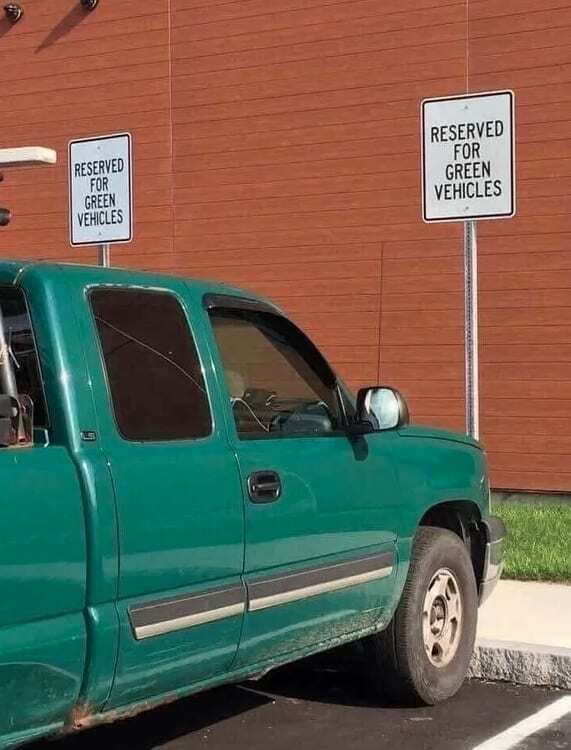 That person is not going to have an easy time pulling out, that’s for sure. These backyard trampolines can be a whole lot of fun for the whole family, but they’re definitely not easy to transport from place to place. 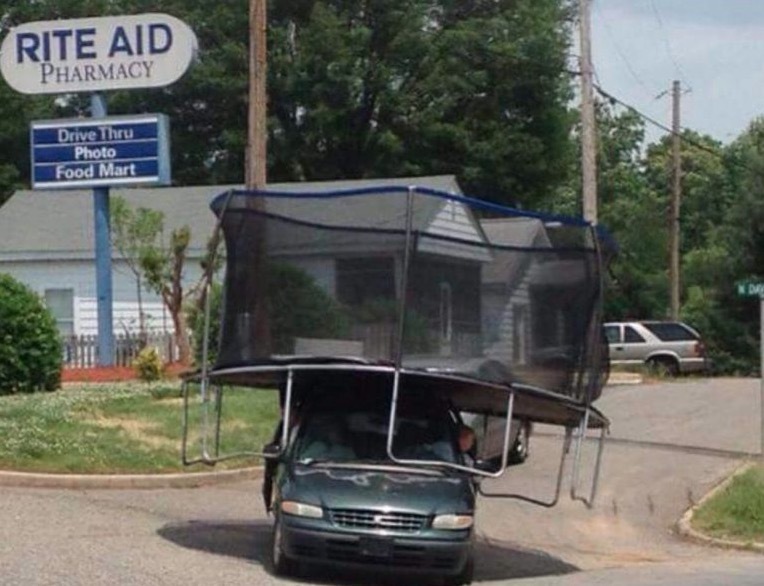 This risk-taker decided to simply load the trampoline up on top of the family minivan. 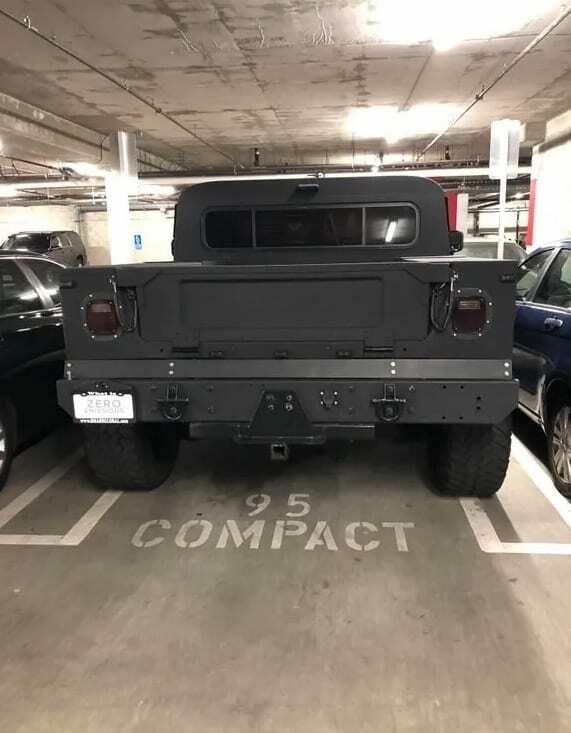 It can’t be easy to drive around with all that extra bulk on the car, and there’s no way that van will fit in just one lane. We hope the parents left the kids at home for this treacherous journey! When you have a flat tire, you can’t keep driving around on it – that’s really dangerous! 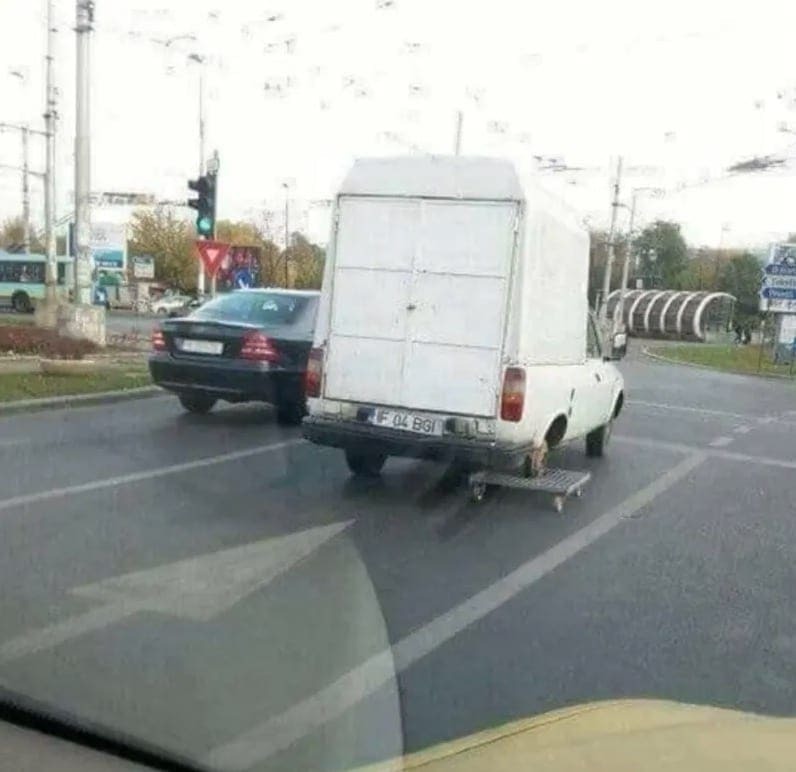 So what do you do if you still need to get where you’re going but don’t have a spare? To be honest, we don’t have a good answer to that question, but we can tell you with certainty that you should not do this. 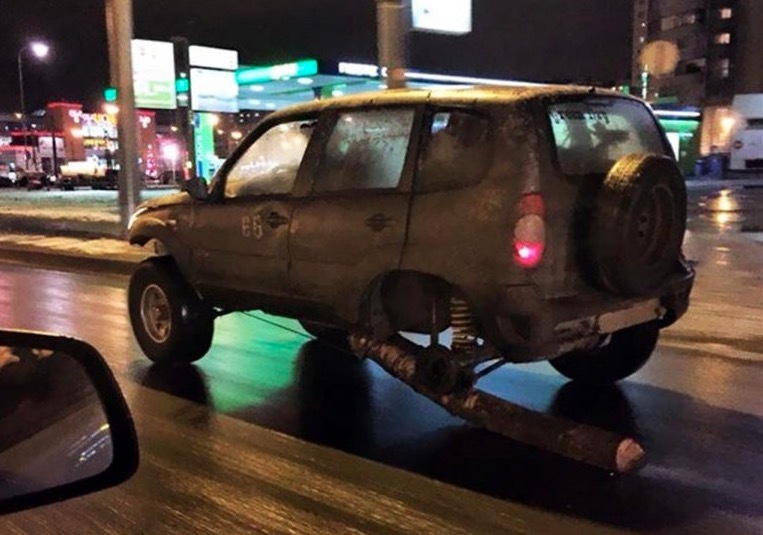 This driver decided to replace one of their wheels with what looks like a big log. 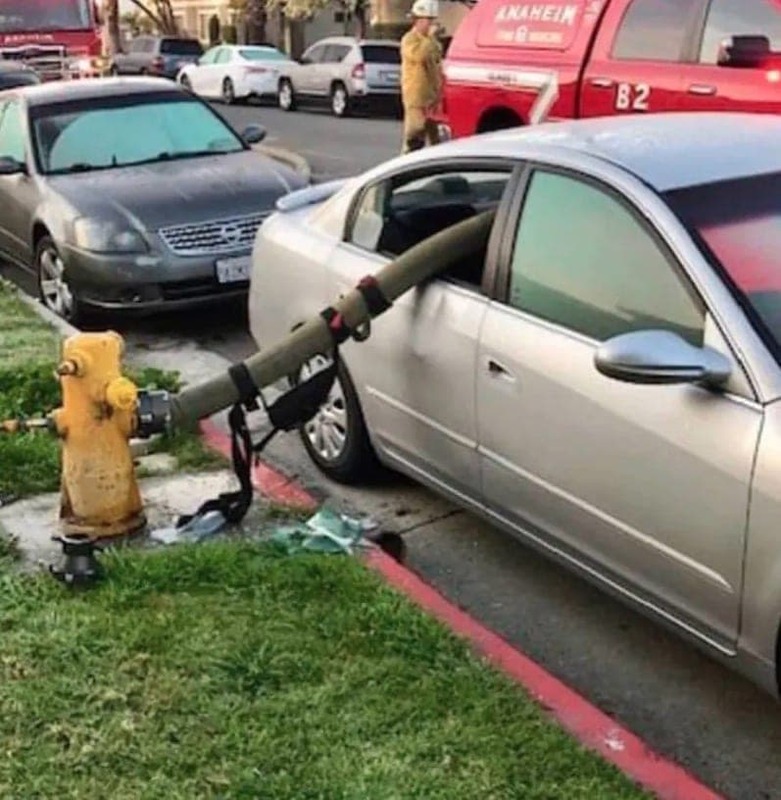 That can’t be good for the vehicle! 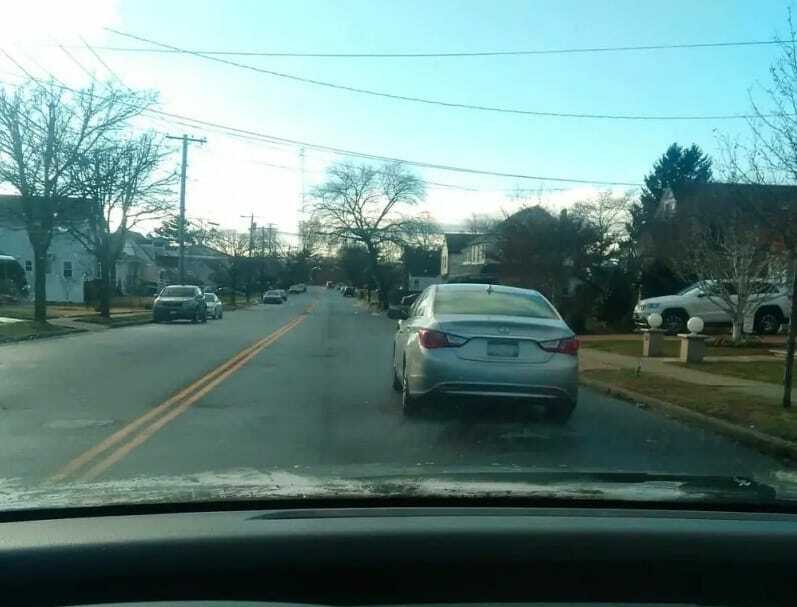 Good drivers know that they should always be paying attention to the road. 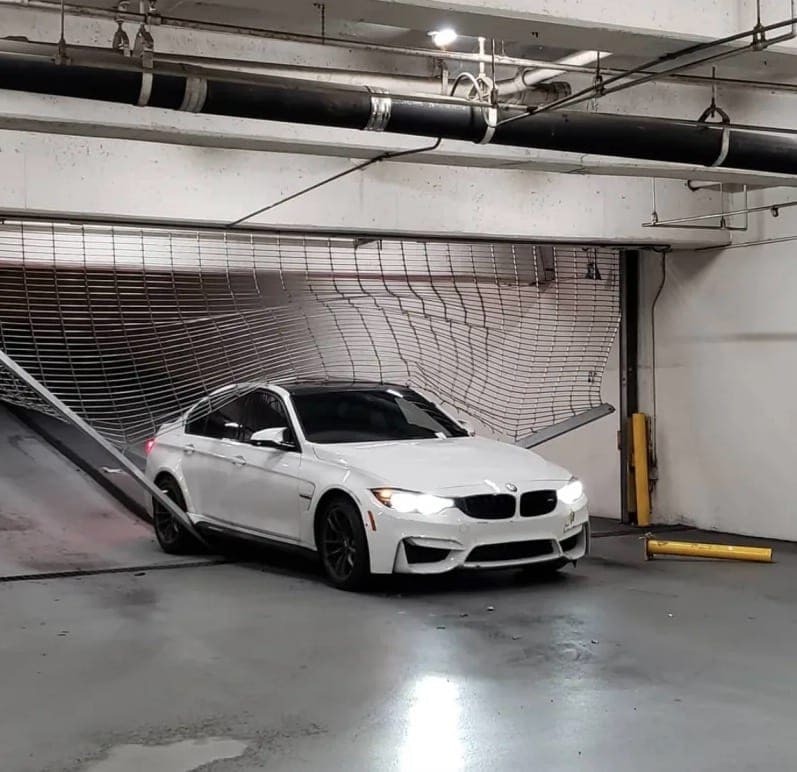 When you’re driving a car, it’s a very bad idea to start doing other things like making phone calls or texting, and some places even have laws against it. 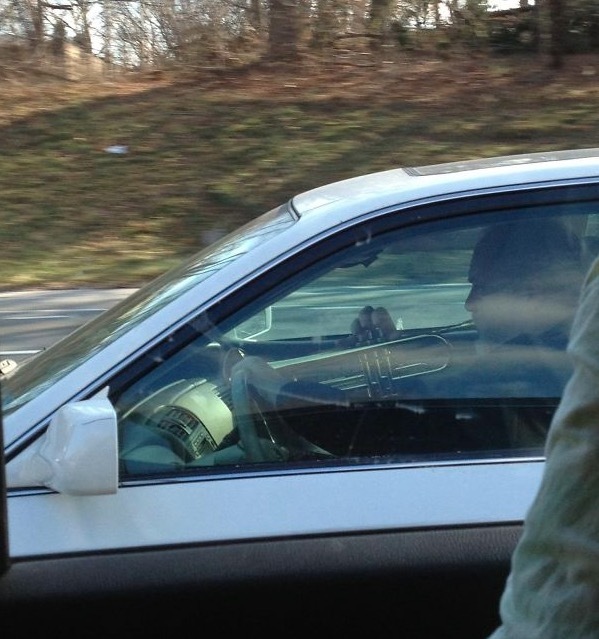 On that note, playing a trumpet while driving a car sounds like a really terrible idea. With only one hand on the steering wheel and a big metal instrument in his face, this guy is definitely a safety hazard. 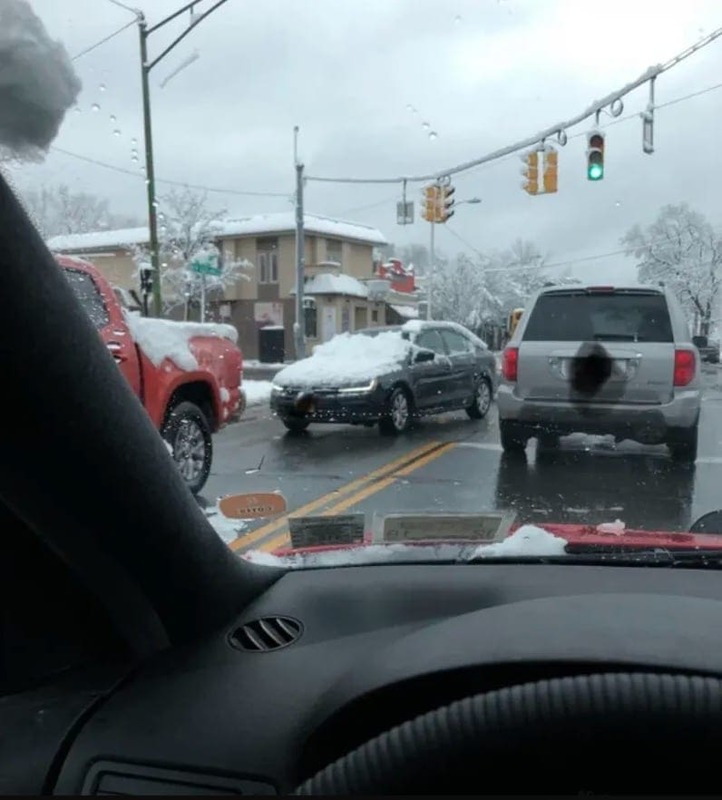 Speaking of doing things you shouldn’t be doing while driving, here’s one we almost couldn’t believe. When we first saw this picture, we were sure we were looking at it wrong. 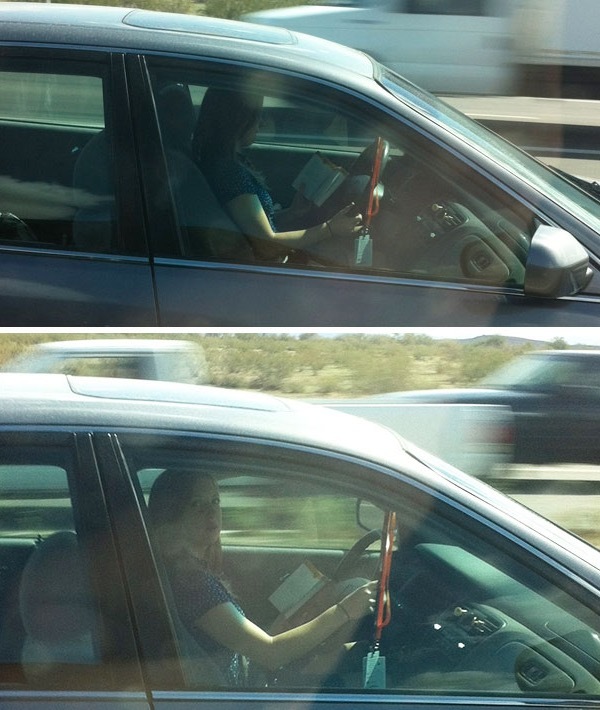 How could someone seriously try to read a book while driving? 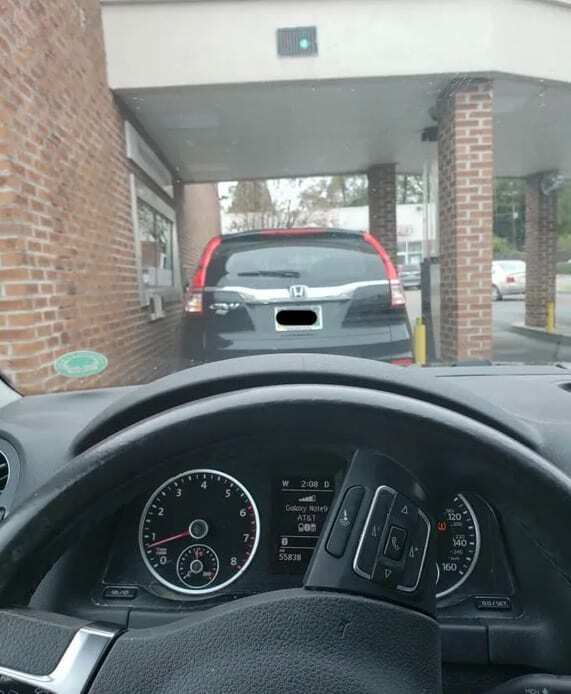 Unfortunately, the driver in this picture does indeed appear to be reading while sitting behind the steering wheel. That’s almost impossible to do, and the book surely diverts her attention from the road, making for an extremely dangerous ride. 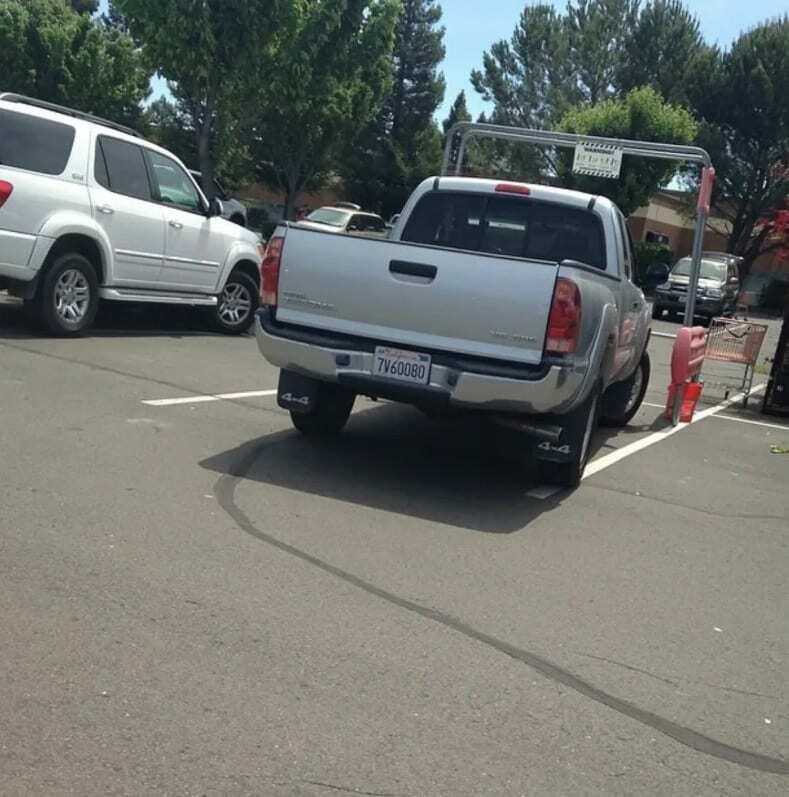 For some reason, there are people who truly believe that they are entitled to park however they want. 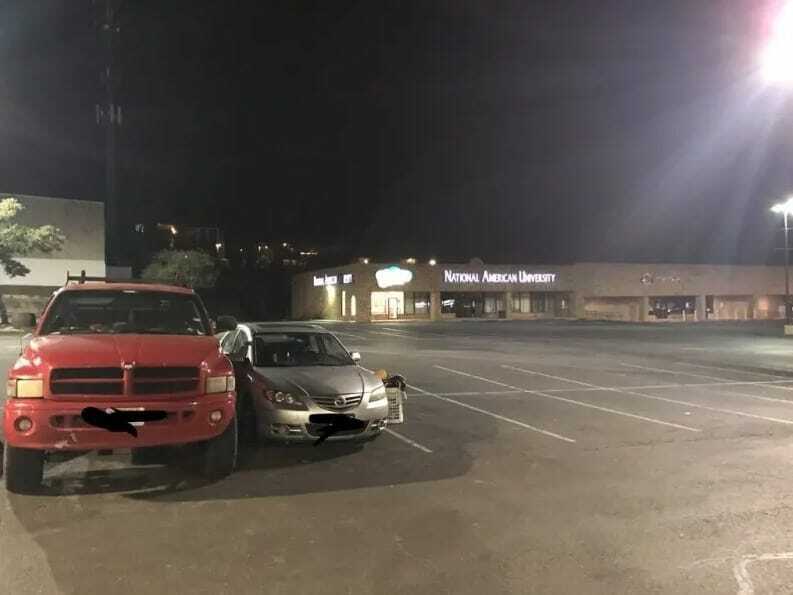 Even though this is a parking lot where people pull into spaces in order to accommodate as many cars as possible, one driver felt like parking their SUV their own way. 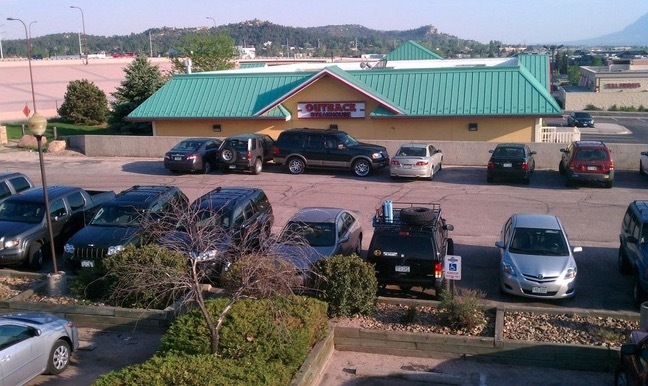 They parallel parked on the side of the parking lot. 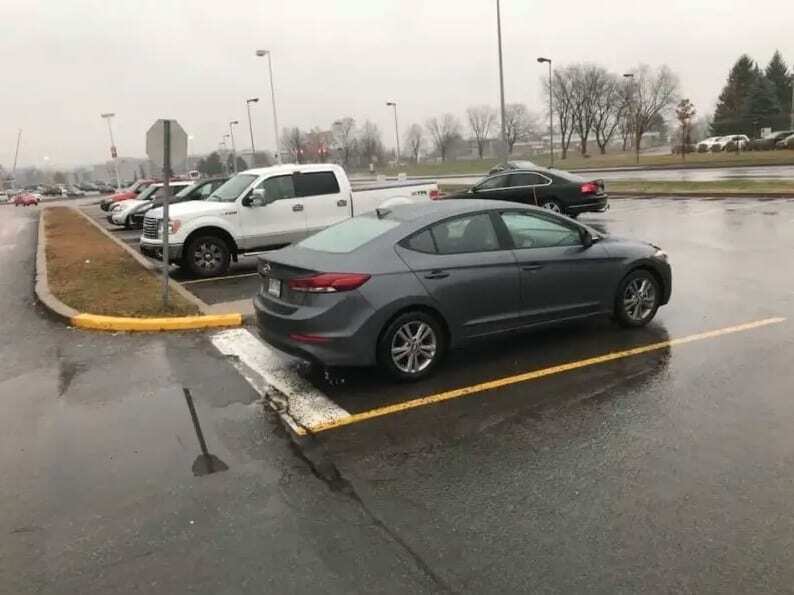 This doesn’t seem like it helps them in any way, and now that other cars are parked on either side, it’s going to be quite a challenge to pull out. Transporting big appliances like washing machines is not easy. 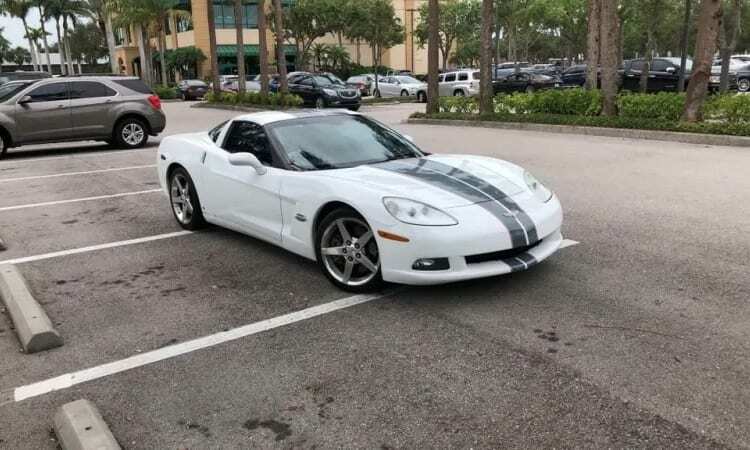 Often, people pay the sellers or a moving company to deliver it for them, because they don’t fit in your average car. However, this person decided to do it themselves, and proceeded to fasten the washing machine to the hood of their car. 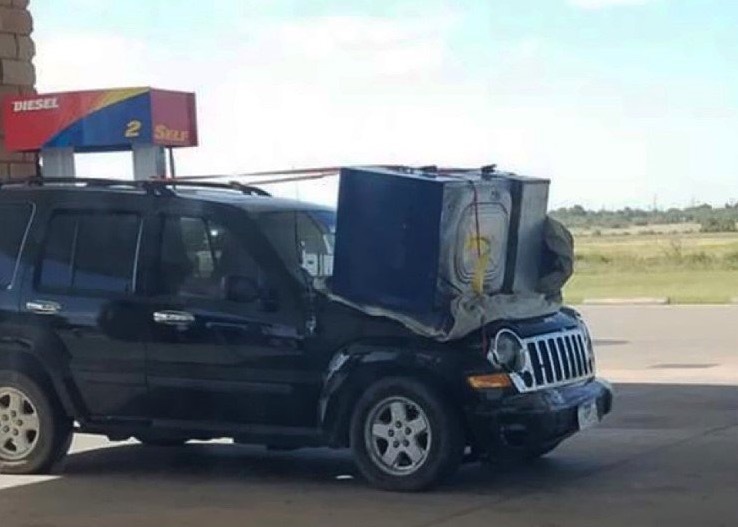 They even put a blanket underneath the washer to protect their car. 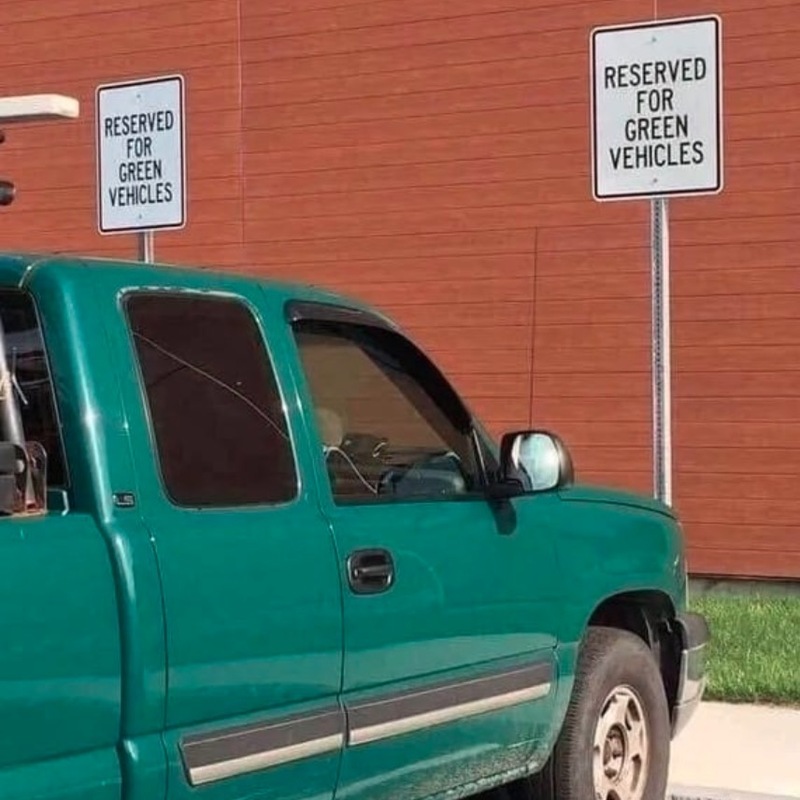 They’re probably going to want more protection than that once they get on the road, though, because the driver can’t see out of the windshield.